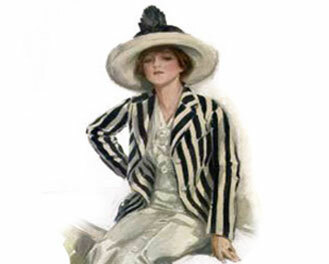 See photos and fashion prints of Titanic Era clothing. A collection of Titanic Era dressy tailored costumes feature reversible surfaces. The straight-cut jackets, with their neat panel backs, straight underarm pieces and becoming modifications of the loose box fronts, reach to a twenty-eight or thirty-inch length. The fronts are cut to almost fit the bust, thus suggesting rather than defining the curves of the figure. Stitching and dart seams are used to give the merest suggestion of trimming. These dart seams run from the shoulder line diagonally toward the front, and are attractively finished with a little embroidered arrow-head. Plain colors are backed with a solid contrasting color, stripes or checks. The skirts to match these coats are quite plain and as a rule the skirt lengths reach to within two and one-half inches of the floor with a width measuring at least two yards and a quarter around the bottom. See photos and fashion prints. Shoes … Shoes … and more Shoes! Hundreds of period shoes beginning with the 18th century through 2000. Exquisite period costumes from popular films including The Duchess, Sherlock Holmes, Sense and Sensibility and The Phantom of the Opera. The pelisse was a long-enduring fashion in the first decades of the 19th century. Fashion & Textiles Collection is examined under the microscope providing an intriguing, investigative exhibition.